Natures Aid Kidz Immune Support liquid contains vitamins C, D3 and zinc which contribute to the normal function of the immune system. 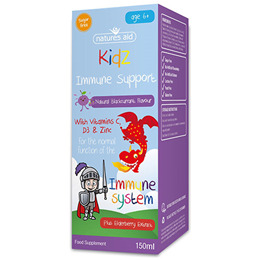 Kidz Immune Support liquid is sugar free and contains no artificial flavours or colours. Children aged 6 - 12 years take 1 teaspoon (5ml) daily. Dilute with water if preferred or add to juice. Shake bottle well before use. Once opened keep refrigerated and use within 4 months. Below are reviews of Natures Aid Kidz Immune Support - 150ml by bodykind customers. If you have tried this product we'd love to hear what you think so please leave a review.